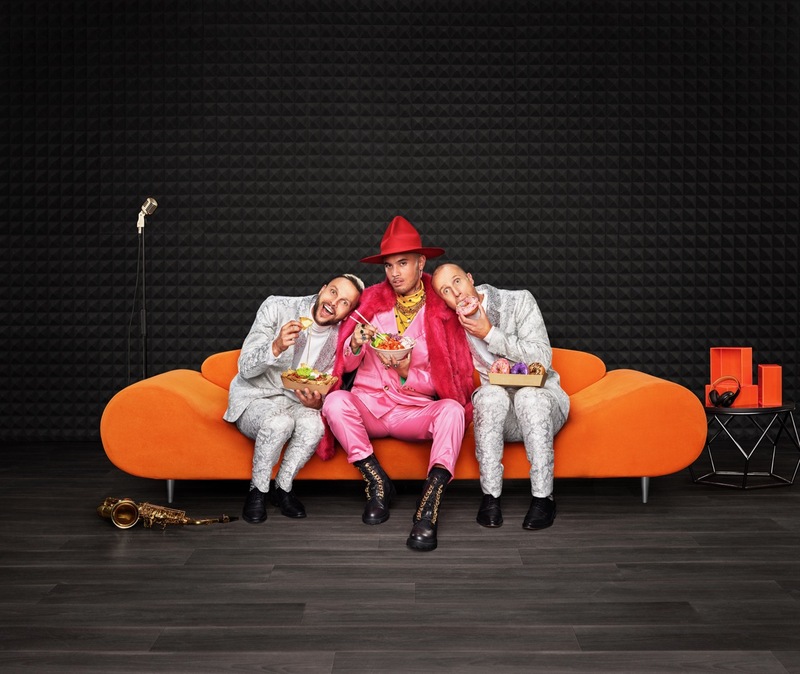 Stan Walker meets Jono and Ben in the latest instalment of the tongue-in-cheek Uber Eats campaign, Tonight I’ll Be Eating, developed by Special Group. The new advert sees Jono and Ben try their hands at a variety of new career opportunities, all under the watchful (and not totally impressed) eye of seasoned talent judge, Stan Walker. The trio add their own flavour to discussions of what they’re having for dinner, before it’s conveniently delivered straight to them via Uber Eats. Impeccably styled by fashionista Sammy Salsa, Stan sports a sassy attitude along with a fuchsia fur coat, pink silk suit and a yellow and black polka dot button down shirt, while Jono and Ben don fabulously reflective embroidered silver suits to fumble their way through auditions to work for Stan in various roles including backup dancers, maraca players and lighting directors. Stan says he is an Uber Eats fan and regular customer in his daily life, finding it easy to order in with his packed schedule. Steve Brennen, director of marketing, Uber Australia & New Zealand, says the goal is to inspire Kiwis to explore their mealtime choices. Kiwis have embraced online food delivery – so much so that Uber Eats data shows someone in Auckland ordered Uber Eats 438 times in 2018, while another ordered from 114 different restaurants last year. As a nation 505,595 burritos were ordered in 2018 along with more than 7 million McDonald’s Chicken McNuggets. Stan, Jono and Ben follow Rachel Hunter and Dai Henwood’s Tonight I’ll Be Eating creative which was unveiled last month and will run until June. The local campaign was inspired by Australia’s own celebrity pairings including Ruby Rose, Rebel Wilson, Naomi Watts, Boy George and more. The advertisements were produced by creative agency Special Group and will run across a range of digital and on-demand platforms. Each celebrity combination has a series of different ads, from a full-length one-minute ad to a shorter 15 second clip, all relating back to the initial concepts. Abysmal acting complemented by an uneventful script. Who in their right mind would pay more than a Tic Tac for “talent” like Jono & Ben? What got me was having Stan Walker saying all that he was going to eat when his stomach removal surgery would maybe not allow him to eat like that?